Our custom wood letters come in different sizes and material. You are in control of the font styles and sizes. 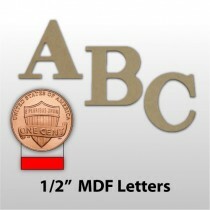 These letters are perfect for indoor or outdoor signage that needs a wooden letter look. 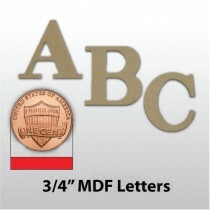 Our wooden lettering comes in 3/4” or 1/2” thickness. At SpeedySigns.com you can find quality wooden letters made at an exceptionally low price. Our custom wooden letters can be used for both interior or exterior signage. Our wooden lettering is available in a variety of fonts and sizes. We have 1/2" thick wooden letters that comes in either unfinished medium density fiberboard or primed medium density overlay plywood. The 1/2” thick MDO wooden letters come primed and are ready to be painted with the color of your choosing. We also have 3/4” thick MDF wooden letters. MDF (Medium Density Fiberboard) is an engineered wood made from small wood fibers pressed together to make a dense composite that is excellent for indoor sign letters and craft letters. MDO (Medium Density Overlay) is a special plywood that has weather-resistant adhesive holding the ply together which mean the plywood will not warp in varying temperatures.These outdoor letters are perfect for making outdoor sign lettering for your business.